Established in the year 2010, as a manufacturer, supplier and exporter of a highly commendable range of Food Processing and Construction Machinery, we, Qualimark Machines Pvt. Ltd. are considered to be one of the biggest names in the industry. This highly praised and preferred range comprises of Khakhra Making and Roasting Machines, Chapati Making Machines, Dough Ball Making Machine, Vacuum Packaging Machines, Shrink Packaging Machine and Flour Kneading. Qualimark has originated with the view of extending pre-eminent and ultimate service to the customers for their appliances. The company is continuously rising on the growth chart and setting very high quality standards. The strict emphasis is on quality combined with the latest technology to offer its customers a competitive edge. It provides Instant Service, conducts Periodical Service Camps, arranges Product Demos, participates in Exhibitions and Fairs, do Direct Marketing, and all services that benefit the valuable customer. Qualimark is poised to shoulder servicing of any of its product with vision to extend prompt service to their valued customers. Under the able guidance of our Owner, “Mr. 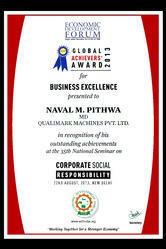 Naval Pithava”, we have been able to set an indelible mark for ourselves in this ever changing market. Owing to his in-depth expertise of this domain, we have been able to cater to variegated requirements of our patrons effectively and efficiently. Qualimark Machines Pvt. Ltd. is an ISO 9001:2015 Certified Company. We are a well-known designer, manufacturer and exporter of World’s most successful Khakhra & Chapati Making Machines since our early start in the year of 2001. One of the main things which differentiate us from others is that we are purely innovation driven company, having our Manufacturing unit spreaded over 25,000 Sq. Ft. & state of the art R&D centre in 5000 Sq. Ft.. We rigorously do developments and up gradations in our products and bring ground breaking innovations to supply world class problem solving products to our customers. We promise innovative high tech products characterised by tremendous quality and reliability. Continuous development work help customers to maximise their competitive ability. You can also profit from 16 years of Qualimark technological leadership in Khakhra & Chapati making machinery. We endeavor to keep preserving on our conventional power and fulfilling our vision of becoming a global leader, keen to professionalism and superiority while striving for the highest level of satisfaction for our clients. The company is continuously rising on the growth chart and setting very high quality standards. Qualimark has maintained focus on “Customer First” attitude by investing in delivering quality products, service and value to customers. The values which we possess are integrity, consistency, innovation and customer focus that have earned us a priceless goodwill in the domestic and international market. We have been manufacturing these machines for 16 Years and have already installed more than 1000+ machines across the Globe. Our successful installations are in more than 16 States in India and in 14 Countries across the Globe like USA, Canada, UK, New Zealand, Singapore, Bangladesh, Dubai, Abu Dhabi, Qatar, Oman, South Africa, Kenya, Botswana & Brunei. Welcome to Qualimark, a company Where Quality Meets Expectations! Highly equipped Machine tool-room consisting of all latest machines. Workmanship of our crew is commitment-bound. In-line setup of machines for fast processing of raw material at one end and Finished material at the other end. Highly trained, experienced and technically knowledgeable crew conversant with computer generated drawings. Transparency & Time bound services. Since its inception, the company has established a reputation for itself as a supplier of quality products. We focus on quality and aim to achieve total customer satisfaction, both in the products we offer and in the service that follows. We uphold a state-of-the-art infrastructure base which conforms to the standards of international level in terms of various kinds of facilities. 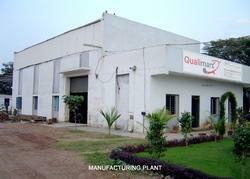 Our manufacturing unit is spread over a total plot area of 2000 sq. meters, with optimum installed capacity that is sufficient to prove our capacity in terms of robust infrastructure. We have equipped this spacious unit with necessary machines and equipment that facilitate flawless production of our wide range of machines. Studying the exact requirement of our client and understanding the job. Digging out plans from our databank and processing out of the drawing by our engineers. Supervisor distributes task among separate machinery and fabrication depts. for component design of the product. Work schedule is estimated on the theory of just-in-time of manufacturing. Final assembly and stacking of dispatch of the finished product by the crew with assurance from supervisors. Our vision is to contribute significantly to the food processing industry by providing trusted machines which can help our users to solve their problems effortlessly by achieving optimum output. In the future, we see ourselves becoming the leader in the Khakhra Making & Chapati Making Machinery space by innovating on a continuous basis and focusing on product and service quality. Our mission is to delight our customers with our innovation driven and problem solving high quality products and superior customer service. We believe that continuous innovation in products is more important than anything else. Hence we aim to continuously innovate our products and ensure that our products showcase convenient and satisfactory user experience. We have well established and well equipped manufacturing unit in Bharuch, Gujarat. We uphold a state-of-the-art infrastructure base which conforms to the standards of international level in terms of various kinds of facilities. Our manufacturing unit is spread over a total plot area of 2000 Sq. Meters giving ample space to carry out various manufacturing activities. It is optimum installed capacity that is sufficient to prove our capacity in terms of robust infrastructure. We have equipped this spacious unit with necessary machines and equipment that facilitate flawless production of our wide range of machines. Qualimark Machine Pvt. Ltd. has been awarded the prestigious ‘Global Achievers Award’ for Business Excellence Category in 35th Indian Achiever's Summit 2013. The award ceremony was organised by Economic Development Forum at India Habitat Centre, Lodhi Road, New Delhi on 22 August 2013. The eminent dignitaries Mr. Sunil Shastri (Son of Lal Bahadur Shastri), Mr. Shushil Kumar (Olympian Wrestler), Dr. Jogindeer Singh (Ex-Director, CBI), and several other personalities were participated in different roles. This award is a sign of Qualimark's continuous rise on its growth chart for various parameters like product innovation, better services and best customer satisfaction. Our team of experts comprises of professionals who have years of profound experience in their related domain of expertise. They are well versed with their responsibilities and are capable enough to successfully execute entire manufacturing procedure along with turnkey projects. Our team of experts forms the backbone of our organization. Our technical team members maintain close vigilance over the entire production line in order to facilitate manufacturing of only high performing food processing machines and equipment. The production engineers strive hard to undertake every stage of the production procedure strictly in accordance with the stipulated standards. During this, they are significantly assisted by supervisors, allied technicians and skilled workforce to expedite the manufacturing process. Further, product designers remain consistently engaged in developing new designs as per the requirements of clients and market trends. In addition to this, our engineers are also given responsibilities to carry out turnkey projects at the site of clients and also provide installation and operational training to client’s representatives. Export Achievements - Qualimark Machines Pvt. Ltd.
Our Patented and first of its kind Chapati Making Machines & Khakhra Making Machines are successfully working in various parts of India and in various other countries such as USA, Canada, UK, New Zealand, Singapore, Dubai, Abu Dhabi, Qatar, Oman, Bangladesh, Kenya, Botswana, South Africa and Brunei. Our highest priority is on customizing our products. We are committed to provide what our customer wants and we provide quality and consistency at the best value.